JNN 30 June 2014 Baghdad : The first delivery of Russian Sukhoi fighter jets arrived in Iraq on Saturday, the country’s Defense Ministry said. Iraqi Prime Minister Nouri al-Maliki is hoping the jets will make a key difference in the fight against ISIS. The Iraqi Ministry of Defense on Sunday confirmed receiving five Su-25 fighter jets in accordance with the deal with Moscow. The jets were delivered by a Russian An-124 transport plane in a dismantled state, and are expected to be set up and become operational within 3-4 days. 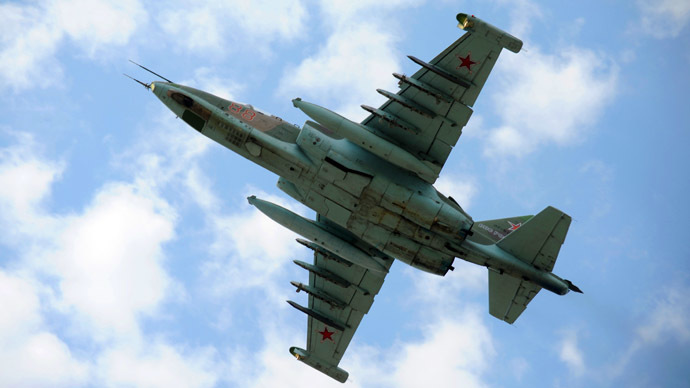 “The Sukhoi Su-25 is an air-ground support and anti-terrorism mission aircraft. In these difficult times, we are in great need of such aircraft. With God’s help, we will be able to deploy them to support our ground forces on a mission against the Islamic State in Iraq and the Levant terrorists within the next 3-4 days,” Iraqi Army Lieutenant General Anwar Hamad Amen Ahmed told Ruptly news agency at an airport receiving the jets. According to Ahmed, Iraq will wage a “massive attack” on insurgents with the help of the jets. “We have experienced pilots and other professionals. Our Russian friends have also sent their own experts to assist us in preparing the aircraft. All the logistics have been planned for as well,” the lieutenant general said. Earlier, Iraqi MP Abbas al-Bayati was quoted as saying by local media that ten Russian jets have been delivered, with Iraqi media identifying them as Su-24s. However, the conflicting information has not been confirmed by other sources. The fighter jets will be stationed at an airbase located in the southern part of the country, PressTV reported, citing military sources. Earlier this week, Prime Minister Nouri Maliki revealed that Iraq purchased jets from Russia and Belarus in order to help its fight against Wahabi terrorists from the Islamic State in Iraq and the Levant (ISIS/ISIL). At the same time, Maliki criticized the US for taking too long to deliver on its own contract after Iraq purchased F-16 jets from America. On Friday, Iraqi Air Force Commander Hameed al-Maliki confirmed the shipment of MI-35 and MI-28 Russian helicopter fighters to “keep the momentum” in the attacks against ISIS, Ruptly reported. The United Nations says more than 1,000 people – mainly civilians – have been killed during the surge thus far. Iraqi army troops have retaken full control of northern city of Tikrit from the so-called Islamic State of Iraq and the Levant (ISIL) terrorist group. This comes after army forces attacked the positions of the Takfiri militants from four different directions. The latest development could facilitate the Iraqi army’s advance toward Baiji and Mosul. Meanwhile, an unspecified number of militants were killed and at least 20 vehicles belonging to the terrorists destroyed during the latest round of operations near the city of Samarra. In another development, the ISIL militants overrunning northern Iraq have kidnapped dozens of Shia civilians and destroyed two Husainiyah ( Imambargah ) in their Occupied areas . Human Rights Watch (HRW) says the Takfiri militants attacked two villages near the city of Mosul and ordered its residents to leave their homes before taking away at least 40 men. Soldiers of the Iraqi army have been engaged in heavy fighting with the militants in different fronts and have so far been able to push back militants in several areas. The Iraqi army began its clean-up operations from the capital Baghdad a few days ago. The army troops have managed to retake several areas from the terrorists, killing dozens of them over the past few days. This entry was posted in Europe, Iraq News and tagged Fighter jets, Iraq, Iraq Airforce, Iraqi Army Lieutenant General Anwar Hamad Amen Ahmed, Iraqi Ministry of Defense, ISIL Terrorists, ISIS, Islamic State, Sukhoi Su-25. Bookmark the permalink.